Dear Hackers: Here's a personal challenge from me, Jason Chen. Make the iPhone work with the Nike+ Sport Kit. 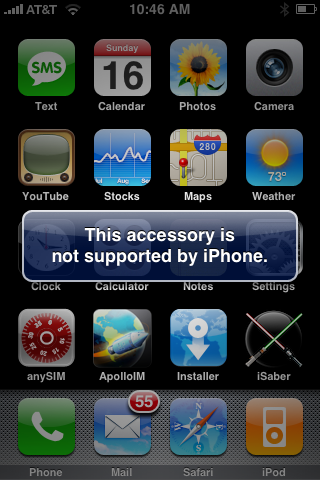 The current status now, when you plug the adapter into the iPhone, is a message that reads, sadly "This accessory is not supported by iPhone." I can understand why Apple made the decision to make the Nike+ Sport Kit not work with the iPhone (providing a reason to buy an iPod Nano, preventing possible damage to a $399 device, differentiating products, whatever), but iPhone users still want this thing to work with their phones. After all, the phone's flash-based, relatively small and light (if you use an armband), and should work perfectly with the kit—in theory. Is making the kit work with the iPhone possible? Can you access the 30-pin accessory port with the iPhone? If you can, is it possible to interface with this thing using the iPod nano as reference? Is this a pipe dream, or could this possibly be done? If enough people get behind this idea, there could even be a bounty set up to reward the hacker(s) that enable this. Let's see where we can take this.